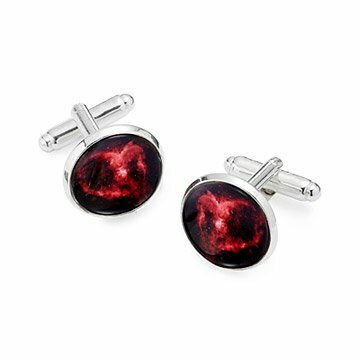 A sartorial celebration of astronomy, these cufflinks feature images of the Heart nebula. A sartorial celebration of astronomy, these unique cufflinks feature detailed images of the Heart Nebula. Inspired by the romantic mysteries of the galaxy, fine art photographer turned jewelry designer Lauren Beacham created these wearable tributes to the Valentine-worthy cloud of crimson hydrogen from the constellation Cassiopeia. Giclee prints of the nebula are showcased under glass on rhodium-plated brass cufflinks, making a great gift for the guy you're over the moon about. Handmade in Maryland. The cuff links arrived tarnished. i tried to clean and polish them the best I could but they still look nothing like the photo in the catalog. I wanted a pair of cufflinks for my boyfriend (who I'm totally in love with) and this fit the bill! Really well made and delivered quickly. Thanks!